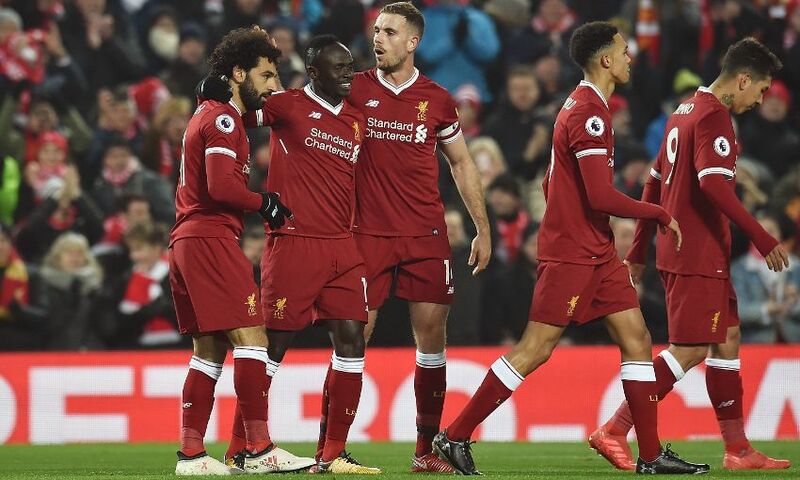 Liverpool moved back up to second in the Premier League as they earned a 2-0 victory over Newcastle United at Anfield on Saturday. Mohamed Salah put the Reds ahead late in the first half, grabbing his 24th league goal of a remarkable debut season with a typically cool finish. And Sadio Mane increased the hosts' advantage shortly after the restart, capitalising on good work from Roberto Firmino to sidefoot home. Liverpool subsequently saw out the match with minimum fuss, enhancing their hopes of Champions League qualification with another performance of impressive ruthlessness. Jürgen Klopp made two changes to his line-up, with James Milner and Joel Matip dropping out from the side that beat West Ham United, and Jordan Henderson and Dejan Lovren replacing them. The hosts wasted little time in establishing control, dominating possession from the off as Newcastle looked to sit deep and close spaces. The Magpies' approach was almost immediately undone when Jamaal Lascelles misjudged a cross five minutes in but, fortunately for the defender, Mane was unable to get a shot away in time. And from then on the pattern of the game was set, with Newcastle enjoying plenty of succcess in their bid to frustrate the Reds' attackers. As had been the case against West Ham United a week earlier, it looked like set-pieces might offer Liverpool a way of finally breaking down the Newcastle defence. But when Lovren met an inswinging corner half an hour in, he saw two successive headers kept out - first by Martin Dubravka and then Mikel Merino. When the goal finally came, it was in a manner more familiar to watchers of Klopp's teams, with Alex Oxlade-Chamberlain pouncing on a loose ball in midfield, driving forward and feeding Salah, who finished through Dubravka's legs. The strike provided a sizeable boost just ahead of half-time, but Liverpool owed it to their goalkeeper that they actually held that lead into the break. With the fourth official still indicating a minute of added on time, Mo Diame launched an effort from the edge of the box that looked destined for the top corner only for Loris Karius to claw it away in brilliant fashion. Liverpool started the second period in similar mood, and had a strong claim for a penalty waved away when Salah's shot was blocked by an arm inside the box. But no Newcastle man could get near to either the ball or the relentless wave of Red that resulted in the second goal just 10 minutes into the half. The visitors looked in trouble as soon as Firmino found space behind their midfield, and so it proved as the Brazilian drove forward before slipping in Mane for an open-bodied finish into the Kop-end net. Rafael Benitez called for Joselu in the aftermath of the hosts' second in a bid to give his players an outlet for more direct play, but Lovren and Virgil van Dijk - imperious all afternoon - continued to sweep up attacks with little trouble. Liverpool's forays forward became less frequent as the match neared its end, with the Reds happy to keep Newcastle at arm's length and protect their two-goal lead. And it was this approach that helped Klopp's men see out the final moments of the match in calm fashion and pick up three precious Premier League points.